After helping retailers “get content with their web content” at last year’s Autumn Fair International, I’m delighted to have been invited back to give the same talk at next week’s Spring Fair – the leading European trade fair for home and gift retailers, featuring more than 3,000 wholesaler exhibitors. I’ll be giving you 14 practical tips to take away, covering how to develop interesting content for your website that truly represents your brand, and how to get the right balance of promotional activity and insightful content that will attract new customers and encourage repeat visits from existing ones. Crucially, my tips are equally relevant whether you’re running a physical shop, selling online, or both – just as great web content can help draw customers into your e-store, it can also drive footfall to your bricks and mortar shop by raising awareness of what you offer. My talk takes place from 15:30 to 16:00 on Day 2 of Spring Fair (Monday 4 February), and will be in the E-commerce and Social Media Theatre, which is in Hall 12 of the NEC. Do come along and say hello – it will be a pleasure to see you there! If you can’t make the seminar, don’t worry – I expect to be in attendance at Spring Fair for most of the day, so do drop me a tweet (to @soult) or an email if you’d like to catch up. In the meantime, wish me luck! 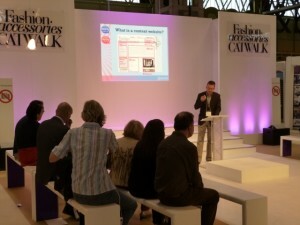 My retail consultancy business, CannyInsights.com, helps retailers with many of the issues highlighted in this blog post, including critiquing websites’ appearance and usability, creating and improving web content, proofreading web copy, and helping businesses get to grips with social media. For more information on how CannyInsights.com can support your business, visit www.cannyinsights.com, drop me an email, or give me a call on (0191) 461 0361.